What started as a cure for sleeplessness for South Auburn resident Scott Nichols has become a full-time work-from-home job. The classically untrained maker of avant garde lamps and light fixtures will be one of at least eight pop artists featured at the Dietrich Theater in Tunkhannock beginning Sunday, March 25. The exhibit will get an extra boost on Sunday, April 8, with a reception sponsored by the Kitson Arts Alliance. Nichols is the owner of Seven 810 Fixtures, which he has promoted largely through social media. 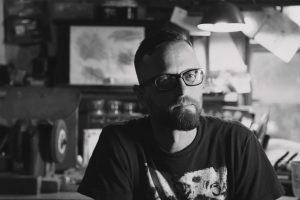 His unusual creations quickly led him to local art shows and consignment shops and have caught the attention of gallery owners as far away as North Carolina, who share his Facebook page. His works, which incorporate lost and found items and family heirlooms have made it to New York and Las Vegas. Nichols related that he quit drinking a little more than a year ago, and one of the unexpected and most annoying side effects was insomnia the likes of which he’d never experienced in his 43 years of life. 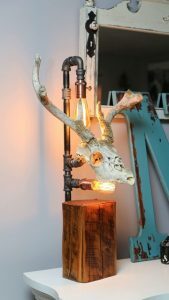 A night of tinkering in his shed led to the creation of his first lamp made with pipes and a board. “I’d never even built a lamp and had no desire to,” he recalls. “It was never meant to be anything.” His previous artistic outlet had always been music, but it had been years since he’d picked up his guitar or played the keyboard. Nonetheless, his wife, Elizabeth, owner of Expressions Photography, was impressed by the piece and encouraged him to make another one. So, he went back to the shed, found some otherwise unrelated items and made another lamp, which Elizabeth encouraged him to put on Facebook. Seven 810 Fixtures is named in honor of their son, Jonah’s birthday (July 8, 2010). Seven months into his new hobby, Nichols was able to quit his day job at a nursing home to concentrate on his new career. He enjoys the freedom of being able to take a break and play with Jonah, which perhaps also sparks his seemingly endless sense of whimsy. 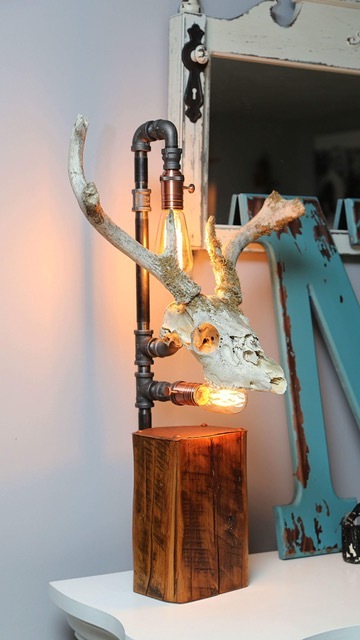 “I started adding antique items and other things. The lamps started taking on personalities,” Nichols explains. “They were little characters in a way, but only to me.” Or so he thought. Nichols names each piece and, as it turns out, the titles resonate with the buyers more than he expected. 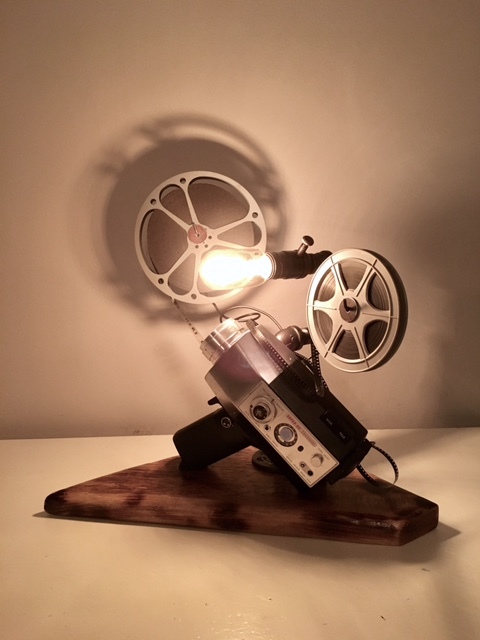 A piece crafted from old film reels became Cinephile. One of the few popular pieces of which he has made numerous copies is called Gum Drop. Its white pipe, distressed colorful base, flowers and green insulator shade has primarily captured the attention of female art buyers. 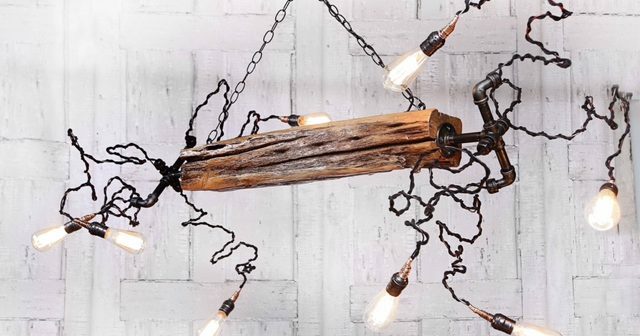 Further proof that a name can mean everything, the one and only all-wood lamp that Nichols created was named Lobotomist because he affixed an antique ice pick to the front of it. As a show at which he was exhibiting was winding down, he started to pack away Lobotomist, thinking, “well, that didn’t sell again.” A woman passing by suddenly ask him what the piece was called. 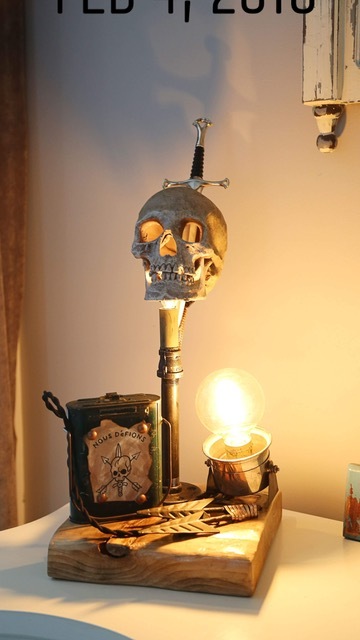 When he told her, she said, “Sold!” Lobotomies were a running joke between her and her husband, she explained, so the lamp was a must-have. Most of his best work come from his soul, Nichols explains, but the orders are now pouring in for custom made pieces, for which he does his best to peer into someone else’s soul. One of the first pieces he did on consignment incorporated an old Brownie camera that once belonged to a customer’s father. 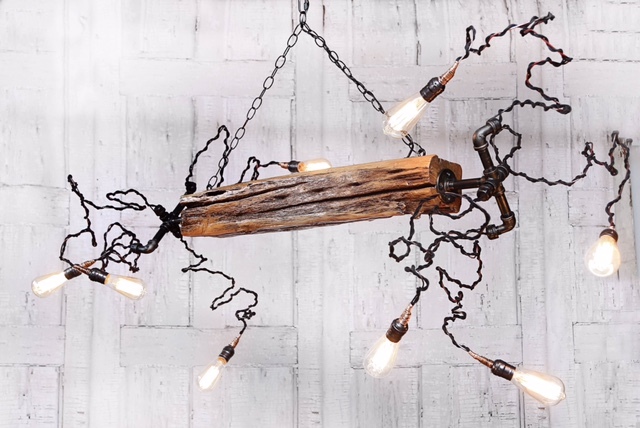 Light fixtures made with family heirlooms like grandpa’s wrist watch and grandma’s jewelry followed. Robinson related that work by Nichols was well-received at a blues-themed art show at the Dietrich Theater last year, so he is excited to have him back for the Pop Art show. In addition to seeing his work on the Seven 810 Fixtures page on Facebook, Nichols can be reached at 570-780-3701. Joining him at the Dietrich Theater this spring will be local artists Mike Resnick, Amanda Robinson, Rhi Wallace, Michelle McKenzie, Joe Kulck, Katrina King, and Eylse Mattocks.